"We've known for 50 years that it replicated better in the nose, but the mechanism has never been clearly defined," researcher Dr Akiko Iwasaki told the BBC. Two important tools - a set of sensors that detect infection and chemicals that co-ordinate the immune response - were less effective at cooler temperatures. Dr Iwasaki said: "In general, the lower the temperature, it seems the lower the innate immune response to viruses." She said her findings could help explain why the common cold is more common in the cold months of winter. But cautioned that it was "much more complicated". 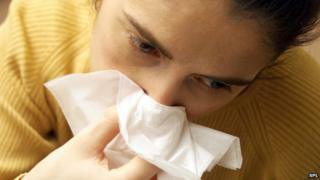 Other factors including different human behaviour in winter compared with summer have also been implicated in winter colds. However, Dr Iwasaki did suggest some ways of fighting a cold: "You can always stay in warm tropical weather or try to prevent the nasal cavity experiencing very cold air." Jonathan Ball, a professor of virology the University of Nottingham, said the findings could explain why rhinoviruses infect the nose rather than warmer parts of the body like the lungs. He told the BBC: "We know the temperature of the cells lining the nose are cooler than other less exposed parts of the body. "This could explain why the rhinovirus causes colds and is less able to cause more serious lung infections, like influenza does."